Aprovechando el poder de Cloud, Okta permite que personas puedan acceder aplicaciones en cualquier dispositivo, en cualquier momento, todo cumpliendo con las más estrictas políticas de seguridad. Se integra directamente con los sistemas de identificación ya existentes en las empresas, y tiene conectores con mas de 4.000 aplicaciones. Como Okta funciona en una plataforma de cloud integrada, las organizaciones pueden implementar y escalar rápidamente el servicio a un costo muy bajo. Más de 2.500 clientes, incluyendo Adobe, Allergan, Chiquita, LinkedIn, MGM y Western Union confían en Okta para ayudar a que sus empresas funcionen más rápido, aumenten sus ingresos y se mantengan seguras. Aprovechando su posicionamiento al centro de miles de clientes, 4.000 aplicaciones y millones de logins diarios de usuarios, Okta emitió un informe de uso agregado de estas aplicaciones, con el consentimiento de sus clientes. Lo interesante de este informe es que muestra una estadística en línea muy precisa del uso real de las aplicaciones. Esto permite visualizar tendencias y predecir lo se viene en 2016. THE DECISION MAKERS CSOs and CISOs take on digital business initiatives Since Okta’s inception, CIOs and IT professionals have largely owned internal identity management — what you might think of as web single-sign-on for employees — within organizations. But as mobile apps, cloud services, and the Internet of Things reshape how industries get business done, and force every organization to become a digital one, the use cases for identity have expanded. 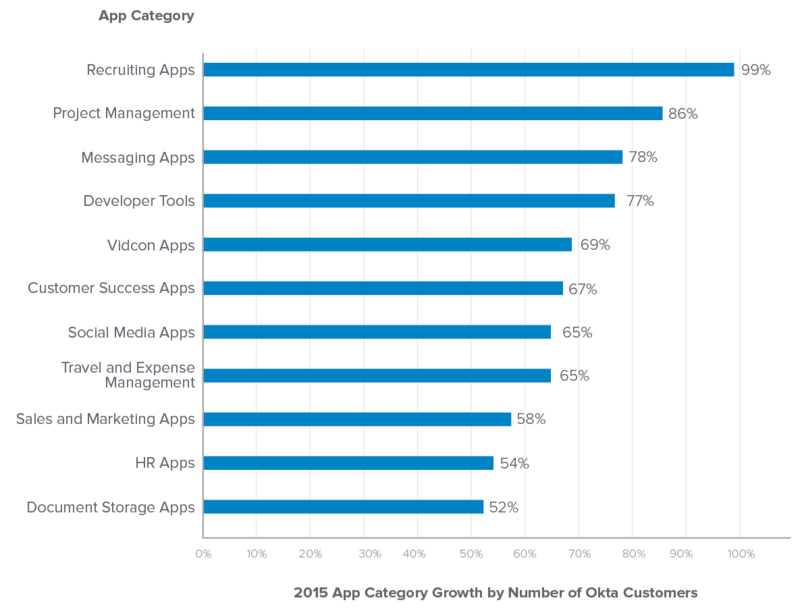 Businesses are building identity layers into their customer and partner-facing websites and portals, as evidenced by the 439% growth of the external identities in Okta’s network in 2015, as compared to 129% growth for internal identities. And as the risk of breaches increases, security decision makers will become key players in digital business initiatives as well. 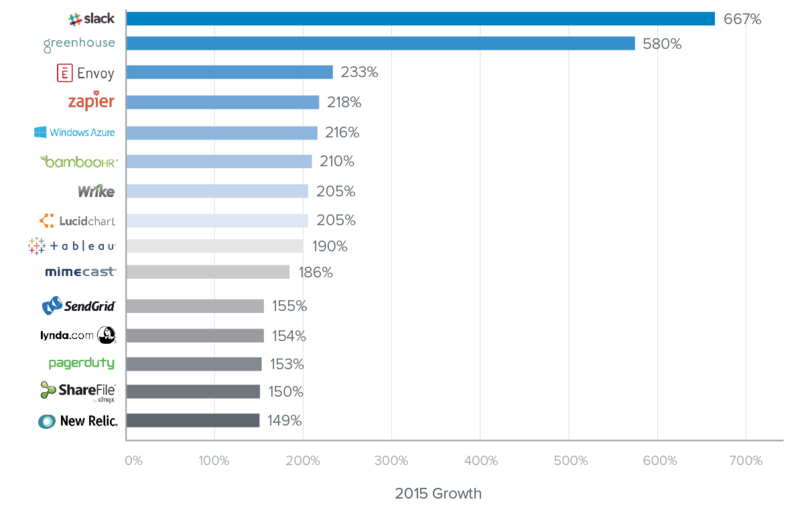 We’re seeing an almost 30% growth year-over-year in the number of Okta deals where a CSO or CISO was involved in purchase decisions for identity management. In 2016, IT and security leaders’ roles will continue to expand as they take on digital business initiatives and own more critical business services. THE COMEBACK KIDS Enterprise tablet use is at a standstill; tablet makers need to rely on partnerships and new functionality to stay relevant. There’s been talk of the brief life of the enterprise tablet coming to an end. 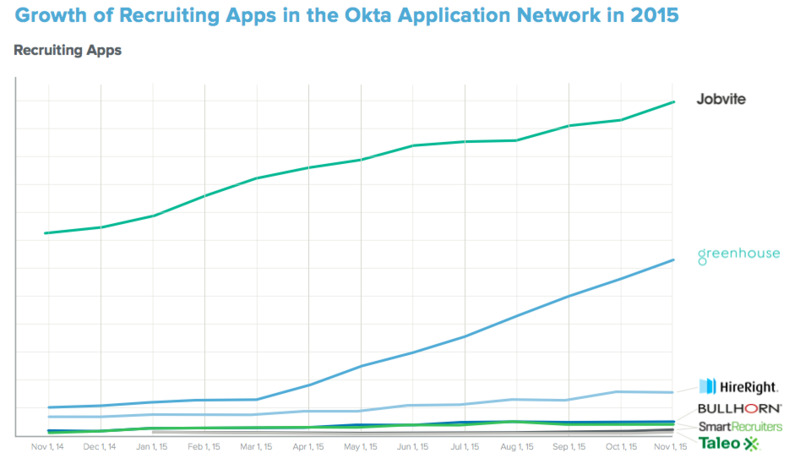 Not only are global tablet shipments declining, but we’ve seen a relative standstill in tablet usage year-over-year in our network, with tablet usage just slightly declining by 1% in the Okta Application Network from 2014 to 2015. The mobile workforce requires tablets to add more value than simply enabling email and web browsing to fully leave desktops and laptops behind. 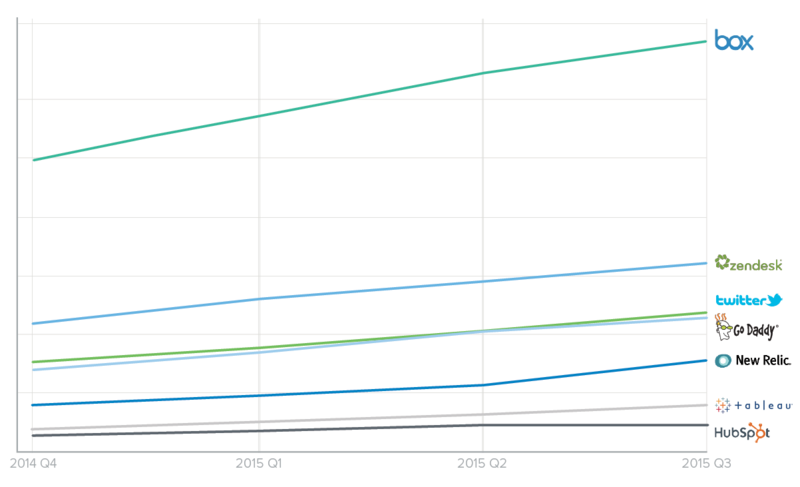 2016 will be a make-or-break year for enterprise tablets. In order for them to survive, manufacturers need to seek out and invest in strategic partnerships to add more computing power, better apps and features designed for productivity. 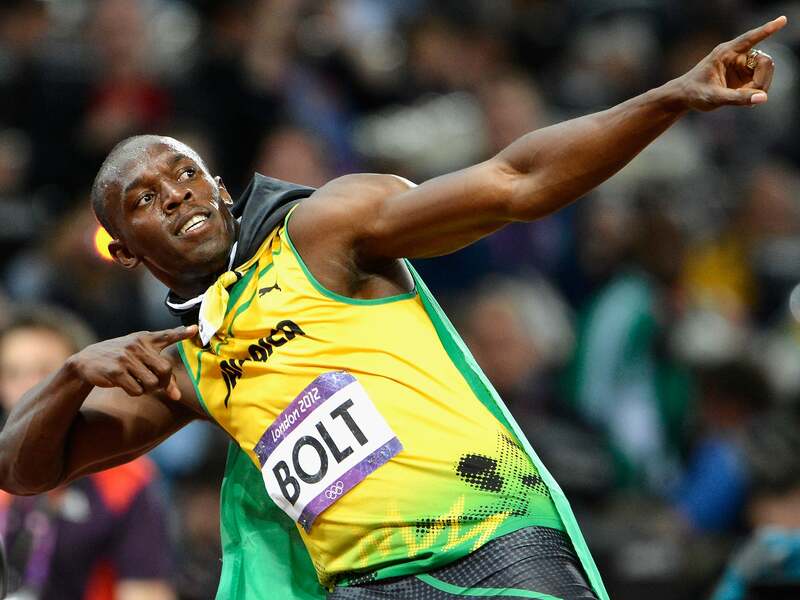 If they can do it, we predict a Justin Bieber-esque comeback. Because let’s be honest: Diplo and Skrillex’s support is the reason Justin’s back in the game. THE SHAKEUP BYOB — Bring Your Own Business — becomes attainable It’s now possible to start and run a small-to-midsized business with no infrastructure: zero physical locations, zero warehouses, zero servers, zero software. That’s right — the zero infrastructure business is becoming a reality. PWC says that “public cloud services are dramatically outpacing general IT spend at 22% versus 4% CAGR.” And Gartner predicts that of the $149.9 billion spent on enterprise application software in 2015, “the majority” went towards modernizing, replacing or extending existing business software using SaaS. 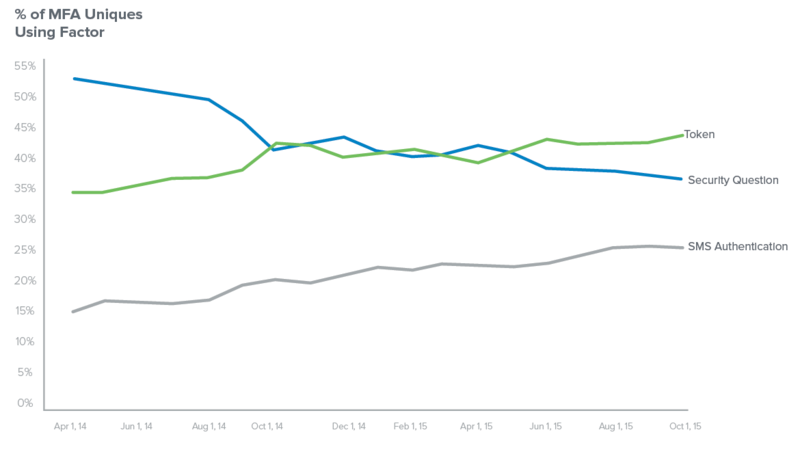 Okta’s own dataset shows that the median number of off-the-shelf cloud apps at companies has grown 33% year-over-year, Amazon Web Services has grown at 123% year-over-year, and Microsoft Azure Cloud Services at 216% year-over-year. To learn more, download our full “Okta’s Best Of: 2015’s Cool Kids, Shakeups and Comebacks” report here, and share your thoughts with us @Okta with the hashtag #OktasBestOf.